Chasmosaurus was a ceratopsian (beaks, horns, and frills) dinosaur that lived in what is now Canada, during the Late Cretaceous Period, between 76.5 and 75.5 million years ago. From snout to tail it measured about sixteen feet long, and it would have eaten plants when alive. The genus name, Chasmosaurus, translates to "Chasm Lizard/Dinosaur" in reference to the two large holes, called fenestrae, in its large frill. These fenestrae are present in the frills of most ceratopsians but are particularly large in Chasmosaurus. Chasmosaurus russelli life reconstruction by Christopher DiPiazza. In general, Chasmosaurus had three horns on its face, two relatively narrow ones on the brows, and a robust one on the snout. The frill was extremely long, and somewhat rectangular. The genus, Chasmosaurus, has accumulated several species within the genus by paleontologists over the years, but some of those, like Vagaceratops, for example, have since been studied further and given their own genus. Currently there are two official species of Chasmosaurus. The older of the two is called Chasmosaurus russelli, which had slightly longer brow horns. The younger of the two is called Chasmosaurus belli, which had smaller brow horns and a deeper, shallow "V" shape to the center of its frill. Chasmosaurus belli skeleton on display at the Academy of Natural Sciences in Pennsylvania. The exact function of the frill is somewhat of a mystery. At first it could be assumed this was a defensive structure against predators, but it was extremely lightweight and the two holes taking up most of its space don't exactly make it a good shield. (Although the awkward shape could have still made it difficult for predators to bite the neck.) The second idea is that the frill helped Chasmosaurus thermoregulate, much like the large ears on many mammals do, by pumping blood through it, cooling it off and thus, the rest of the body. The third idea for the frill is display. These frills could have served as devices for communication between members of the same species, whether it be species recognition or for attracting mates. Although there is no sign of males and females having had differently shaped frills, they may have been different colors in life. Photograph of fossilized Chasmosaurus skin. There was also a wonderfully preserved Chasmosaurus baby that was discovered a few years ago. 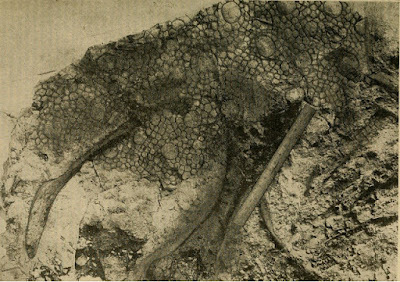 This almost complete skeleton, missing only the front limbs, measures about five feet long from beak to tail. The frill is proportionally shorter which is what we have seen so far with other baby ceratopsians on the fossil record, and the legs aren't proportionally long, as is the case with some other species of baby animals. 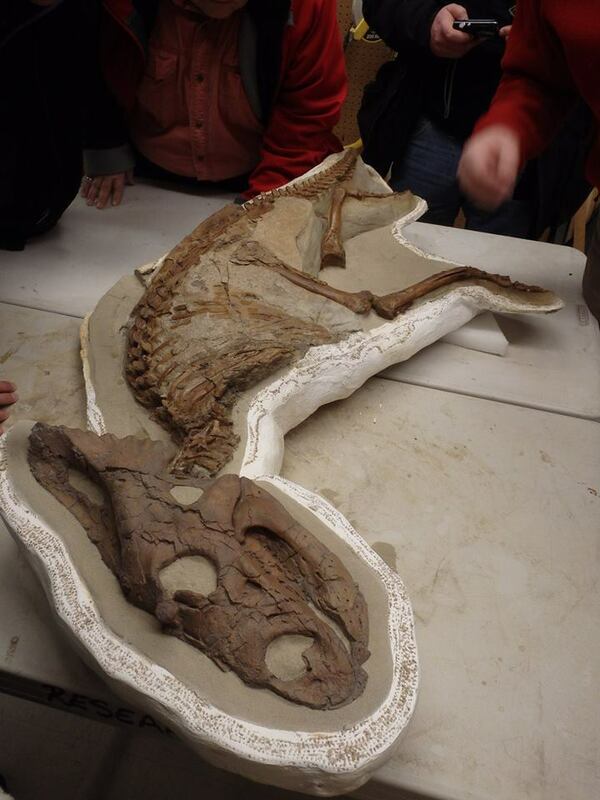 Baby Chasmosaurus specimen at the University of Alberta. Photo courtesy of Darren Tanke. This specimen is usually seen from the side view. 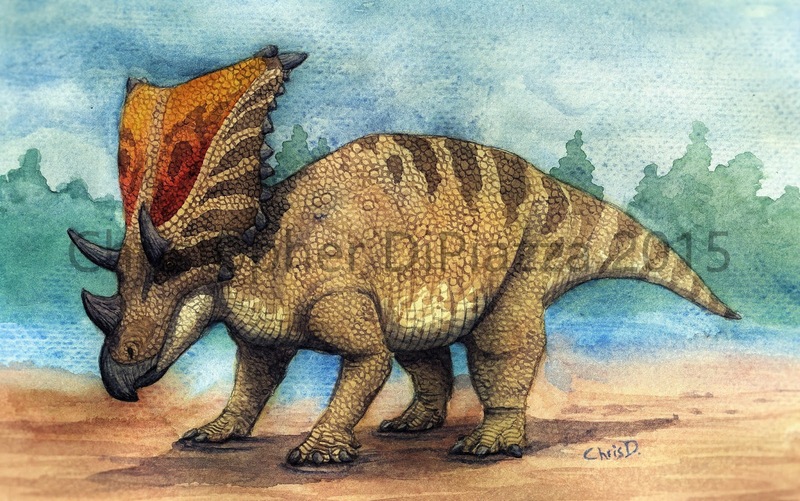 Note how from this angle you can see that even at this early age, Chasmosaurus had finestre in their frills. That is all for this week! Feel free to comment below or on our facebook page. Campbell, J.A., Ryan, M.J., Holmes, R.B., and Schröder-Adams, C.J. (2016). A Re-Evaluation of the chasmosaurine ceratopsid genus Chasmosaurus (Dinosauria: Ornithischia) from the Upper Cretaceous (Campanian) Dinosaur Park Formation of Western Canada. Dodson, Peter et al. "Chasmosaurus". The Age of Dinosaurs. Publications International. pp. 110–111. Ryan, M.J. & Evans, D.C. (2005). "Ornithischian dinosaurs". Dinosaur Provincial Park: A Spectacular Ecosystem Revealed. In: Currie, P.J. & Koppelhus, E.B. (Eds) Indiana University Press, Bloomington. pp. 312–348. Fantastic and interesting post, lots of great information and well researched - the photo of the animals skin is most interesting - keep up the good work! I would love to know if Ankylosaurus had feathers, and if spinosaurs had feathers. Sadly neither one of those dinosaurs gives us enough evidence to say with confidence if they had feathers or not. A feathered Ankylosaurus would look different! I personally doubt Ankylosaurus had feathers, but I want to know for sure.